My Weekly Indicator column is up at XE.com . The intensified deflationary pulse that we have seen in the last several months continues. I have an update up at XE.com, comparing corporate profits through Q3 with stock prices. 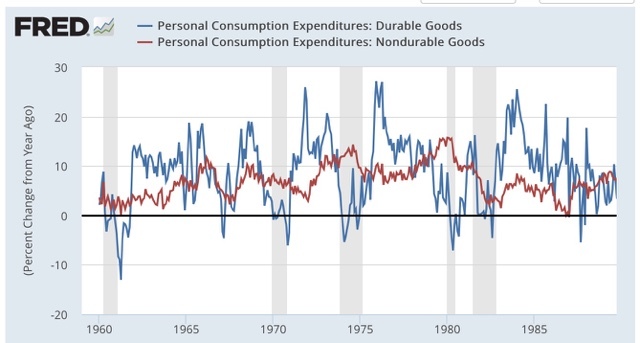 Retail sales minus PCE's are always negative before the economy ever tips into recession. That's 11 of 11 times. 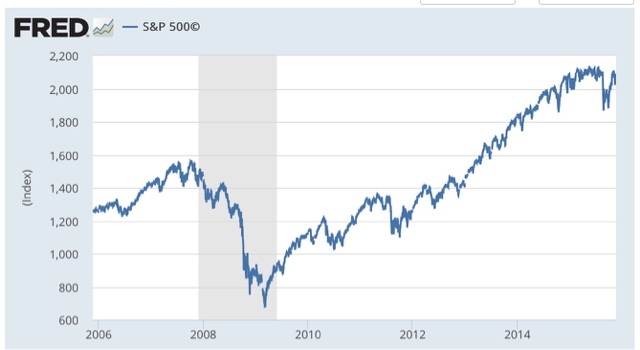 Further, in 10 of those 11 times (1957 being the noteworthy exception), the number was not just negative, but was continuing to decline for a significant period before we tipped into recession. This strongly suggests we are in the late stages of the economic expansion. 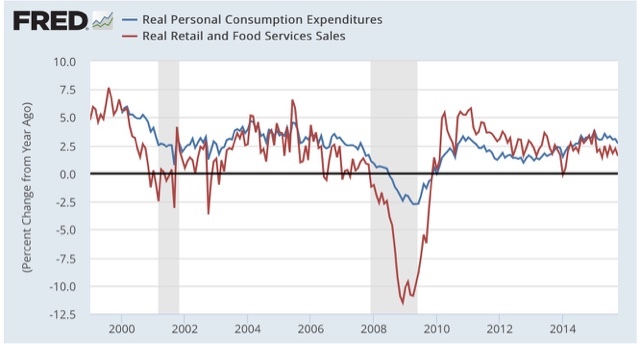 Both are decelerating YoY, retail sales more than personal consumption expenditurres. 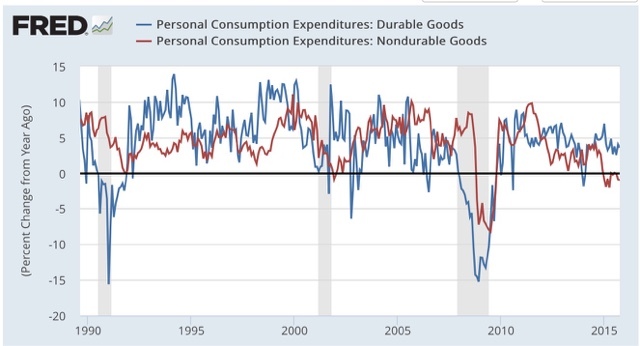 This also suggests that we are getting later in the cycle, but interestngly, durable goods are holding up much better than nondurable goods. At the same time, none of these have turned negative -- just less positive. 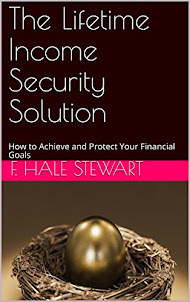 There is no imminent threat of a downturn. 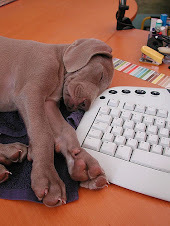 I have a new post up at XE.com discussing this morning's revisions to Q3 GDP. While the revision was positive, the news regarding long leading indicators was significantly mixed. 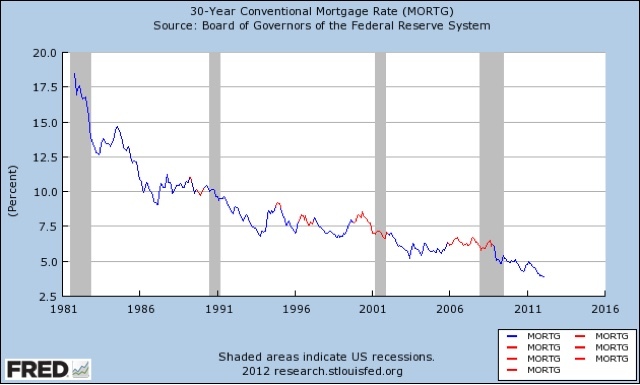 One long leading indicator has turned from green (positive) to yellow (caution): mortgage rates. the middle class has retrenched by curtailing its debt load, thereby bringing about a recession. 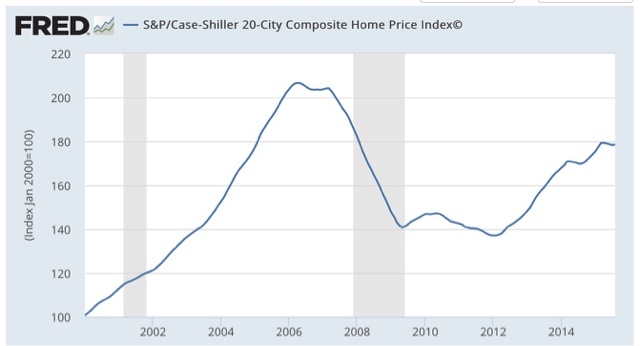 The failure of mortgage rates to make a new low is not the *signal* for a recession. Rather, it has been a necessary predicate. 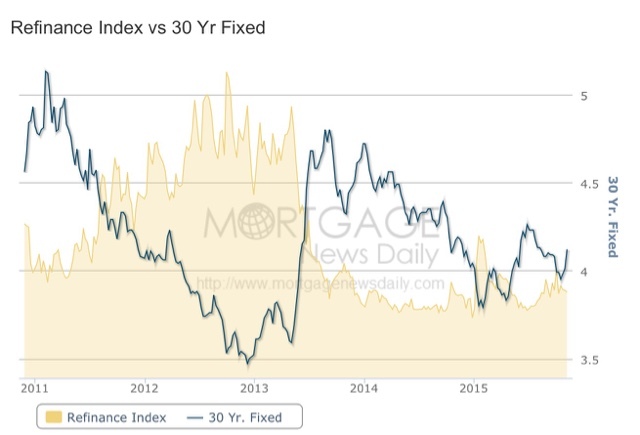 As a result, refinancing applications are stuck near their lows. 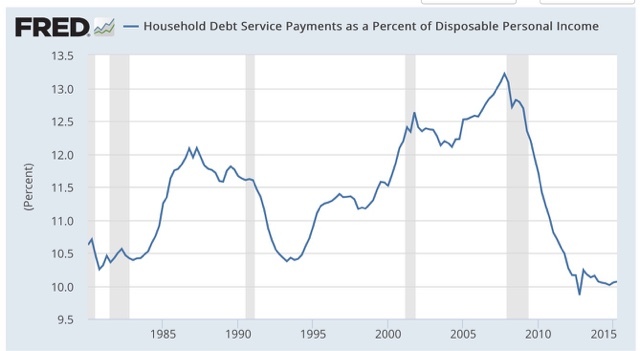 The boost to consumer spending from the last bout of refinancing has run its course. On a YoY basis, gas prices have continued to decline. And we are now finally at the point in the labor market recovery where some upward pressure on wages should start to materialize. So there is no sign of any imminent downturn. 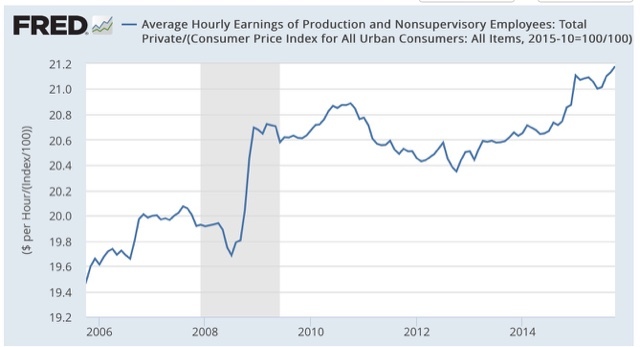 And so long as real wages continue to improve, the economic expansion should continue. But the fundamentals underlying improvement to the lot of the middle class have moved into the yellow, "caution" zone.